The menacing groan of steel against asphalt stirs me from my slumber. The noise is familiar and reliable, but always wakes me with the same thought...I wonder how much snow we got? It’s 6 a.m., the precise time the dedicated Yellowstone National Park plow truck passes my cabin every morning in the winter. I live right on HWY 212 in Cooke City, Montana, one block from “The Plug.” The plug is the 8-mile section of HWY 212 between Cooke City and The Pilot Creek parking lot along the Clarks Fork of the Yellowstone that is not plowed in the winter. It is part of the mystique of this remote mountain town, one way in and one way out by automobile in winter via Yellowstone Park. From the east, the only way in is via skis or snowmobile from the Pilot Creek parking area. I moved to Cooke City 7 years ago, when life dealt me a curve ball and I needed a restart. I decided to pursue my passion and follow the snow to Cooke City. I knew snowfall was reliable in Cooke City, and so far I have been spot on with my assessment. We get lots and lots of snow. 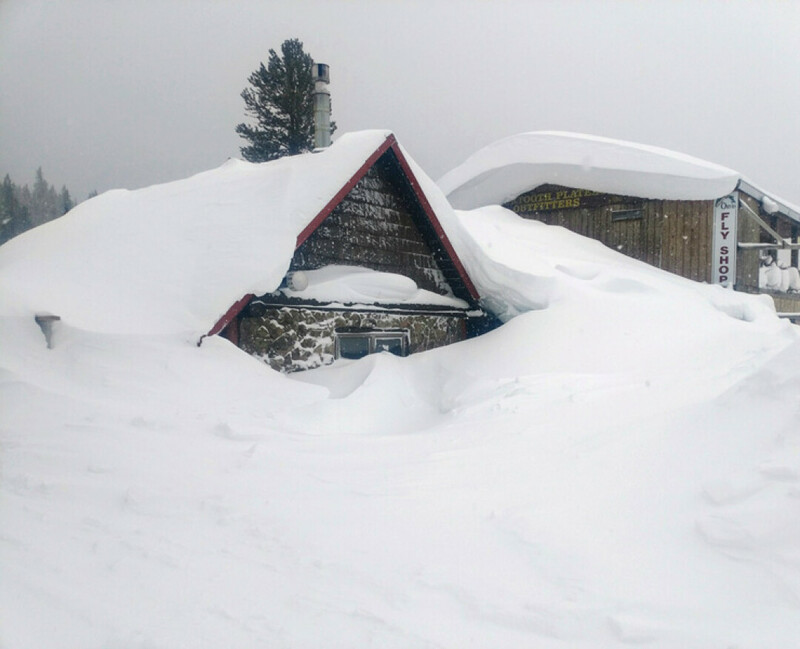 In the past eight seasons, the Cooke City region has had 3 near record snowfall years and every other winter has been above average snowfall. Cooke City appears to be in the perfect spot for modern weather patterns (AKA Climate Change) and I am not complaining. A typical winter morning in Cooke starts with checking the weather stations, weather forecast, and avalanche forecast, and then tending to one of several snow-related duties before heading out for the day. Shoveling snow is the most common, whether you are knocking down the furrow of snow left behind your vehicle from the plow truck, or clearing the wind-drifted snow from the walkway to your house, or bashing a developing ice dam from the eve of your roof, there is always work in the snow maintenance realm. If you don’t stay on top of it, it can get ugly quick. One of the unique things about Cooke City is traveling right from your front door with skis, snowmobiles, or for those who like to suffer, snowshoes. Ski-in ski-out accommodations have a whole new meaning in Cooke City. Skiing Town Hill allows you to ski to and from your front door and get a 1,000 vertical foot ski run in less than an hour, if you are looking to just stretch your legs. For the more ambitious, there is endless terrain around the compass to play. 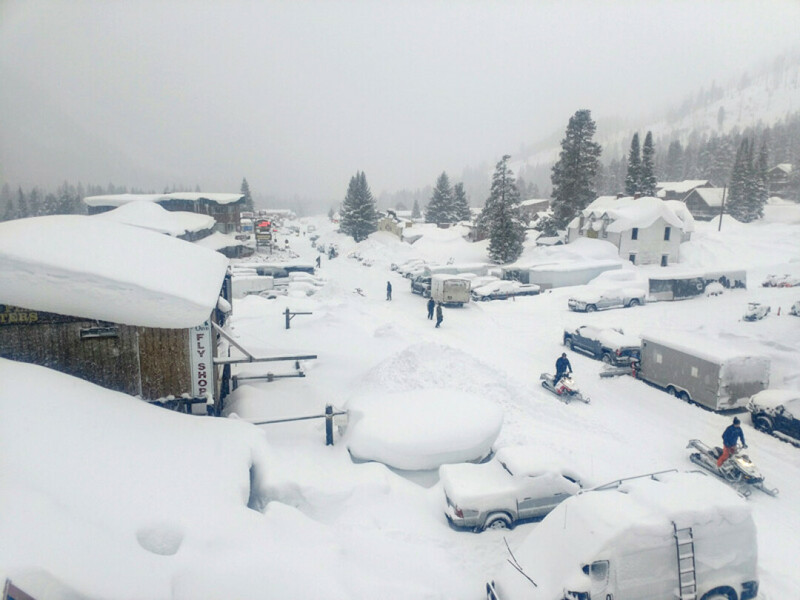 Although Cooke City holds more winter recreation opportunities than most places in the Lower 48, many of Cooke City’s inhabitants are less than enthusiastic about its 9 months of winter. The exact number of locals always seems hard to pin down, but there are only about 70 true year-round residents in the greater Tri-City area, which includes Silver Gate, Cooke City and not to be forgotten, Colter Pass. Residents who have spent many more years in Cooke City than me, develop some curious and entertaining habits you notice if you are around on a daily basis in the winter. The owner of the legendary Hoosiers Bar and Motel, spends most of his days plowing and shoveling snow and clearing his roofs. He generously returns a friendly one-handed wave without ever slowing his snow blower when you wave his way. Wearing his signature coveralls and ear flapped beanie, he methodically moves snow around his very large main street property seemingly every single day. Unfortunately, his motel exploded from a propane leak in 2010 and was never rebuilt, but he still maintains the parking lot as if he is open for business. The Cooke City Exxon is the center of activities in the winter. It is located in the center of town and in addition to a great selection of frozen food and beer, has a large fleet of snowmobiles for rent or sale. My favorite part of walking past the Exxon is watching the owners’ miniature Shelties bark and regulate snowmobiles all day. Somehow they manage to stay out of harm’s way, while nipping and barking relentlessly at the snowmobiles shuttled around the property. Snowmobilers....where to start? Although Cooke City is known as the premier snowmobile destination for big mountain riding in the lower 48, there are only about 9 square miles north of town where all that traffic occurs. The snowmobiles are condensed, powerful and loud. The folks, the bulk of whom are male, that descend on Cooke City in the winter to ride flock here mostly from Saskatchewan, the Dakotas, Minnesota and Wisconsin. Needless to say, there is a lot of testosterone and horsepower in Cooke City. Believe it or not, I have gotten used to the noise in the winter, just like living near the railroad, the sounds of your surroundings become normal, familiar and comforting after time. Several years ago, I witnessed an event from the comfort of my living room that is burned in my memory. I heard a snowmobile riding full throttle up Main Street from a distance. Although this is not encouraged or recommended, it does happen often, especially after the bar closes. As the the snowmobile came past my place with the throttle pinned, the rider tried to make a 90-degree turn. This poor decision resulted in the snowmobile flipping numerous times and throwing the inebriated rider several yards in the air. I was fortunate enough to look up at the exact moment he attempted to turn and witnessed the entire event. The ejection from the sled released the rider’s avalanche airbag mid air. The rider came to a rest motionless in the middle of the road, and as I watched in amazement, a Sheriff patrol car slammed on the brakes skidding past the immobile rider who then awoke, and jumped up from flat on his back like a spooked mule deer. While the patrol car tried to regain control and turn around, the now adrenalized rider flipped his snowmobile right side up and with one pull started the machine and screeched the opposite direction through town. The rider flew through town with his airbag inflated and bouncing against his head in the turbulence and the Sheriff in hot pursuit. The rider was last spotted by the groomer, airbag still bouncing against his head, as he passed the Pilot Creek parking lot. Mortality. The mountains around Cooke City can be unforgiving. Almost every year with the exception of last year, one to two people die in avalanches and additional people die each winter due to traumatic accidents. Although last year there were no avalanche fatalities in Cooke City, two snowmobilers died due to trauma. There is a very small, but skilled and experienced Search and Rescue team in Cooke City. I help occasionally, but am often with clients or too far away to help the SAR team when accidents happen. That being said, in my seven seasons in Cooke City, I have gotten a bit of practice with my CPR and First Responder skills and helped put enough people in body bags to give me a healthy respect for what happens when things go wrong in the backcountry. One of my most poignant memories occurred after living in Cooke City for three years. I was on a probe line with more than 70 people trying to find a 17-year old buried in an enormous avalanche. I was next to a local who was raised in Cooke City. He reminisced with me about his first probe line and dead body recovery. He was 11 years old. Although living in Cooke City in the winters can pose its challenges and hardships, I am constantly reminded of all the great reasons to live here. Whether watching new residents adjust to the nuances of life in Cooke, or witnessing the resilience of Cooke City’s venerable local population embracing the winters, it inspires me to live life to the fullest and enjoy the incredible absurdity of living in Cooke City in the winters. I feel blessed and really feel like I am living the Dream in Cooke City Montana.